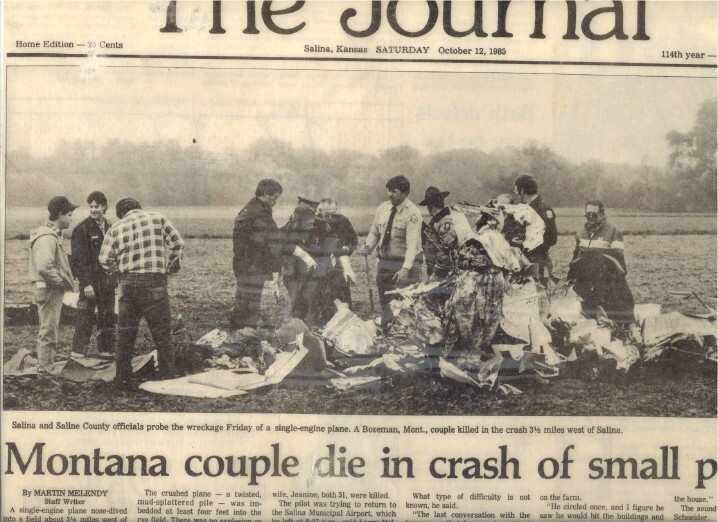 An early morning heavy fog set in on Saline County on October 11, 1985 as a Montana couple lifted off the Salina Municipal Airport runway in their single-engine airplane. Apparently, the pilot didn’t think the fog would be a problem since he was not only a pilot, but also an experienced pilot instructor. But, a problem did occur. Shortly after lift-off the pilot radioed back to the flight tower that he was having equipment difficulties and was returning to the airport. That was his last radio message. Minutes later the 911 dispatch center received a call from a farmer who reported possibly seeing an airplane crash into his field. Emergency crews responded to the scene to find the airplane had gone straight down into the ground – propelling the front of the aircraft several feet into the soft, wet soil. Both husband and wife were dead. Investigators later theorized the pilot lost sight of the ground because of the fog and became disoriented. Instead of trusting his gauges, he went with what he thought was correct. As an instructor he certainly knew better. You can’t predict and plan for every scenario that might happen in an emergency, but not planning for those we can predict is a recipe for disaster. Yet, that’s exactly what those of us in emergency operations often do. And, we make all sorts of excuses for our failure. Here’s a few. I would suggest that you break down your operations into as many categories and subcategories you can think of. Then, schedule regular brainstorming sessions with your people to address each of these areas. Define some clear, best practice, simple steps to each of these categories and subcategories. Pick your best writer and have her put the ideas down on paper. Those that are already written will only need tweaked. Once you’ve been through all the categories and subcategories, start over again. These brainstorming sessions should never stop. Then – practice, practice, practice using them. And, when the emergency comes – trust your gauges.